I am totally pooped after my set up day! 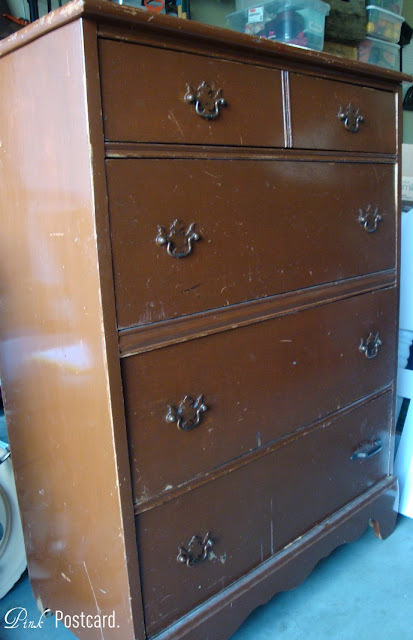 I got a few pictures of the dresser makeover that I showed you earlier in the week. I was really pleased with how it turned out given the fact that I was able to complete it in four days. Here was the before in all of it's brown-ness. I used Behr's Ultra. It covered really well; but I did sand the piece and put two coats of primer on it prior. 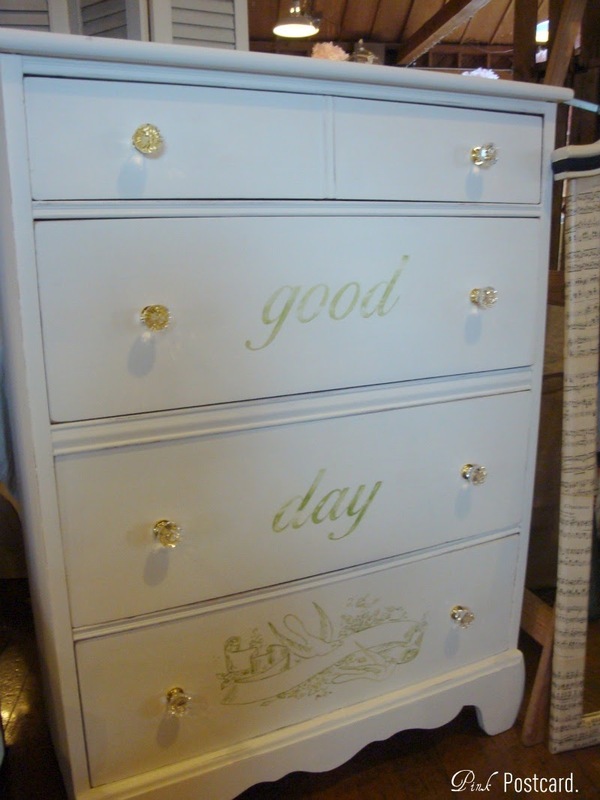 Since it was a pretty simple dresser, I glammed it up with the glass knobs. But it still needed something. I used the bird and banner graphic from the Graphics Fairy and then still thought it needed more. 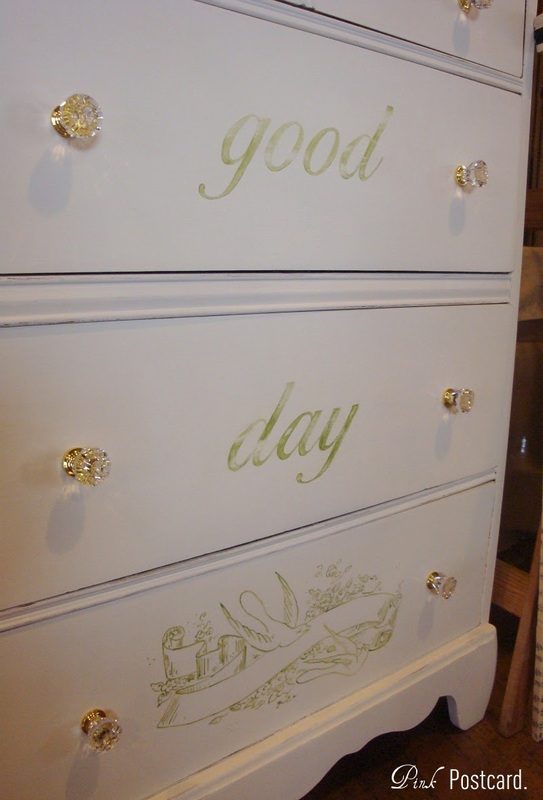 A simple "good day" was stenciled on two of the other drawers. I just used craft paint and discovered a happy accident! See the distressing on the lettering? I was actually trying to wipe away some of my pencil marks with a Clorox cleaning wipe! Sometimes the best discoveries come from a mistake. That's all I have for now. I'm pretty wiped out. I love your dresser! What a wonderful transformation. It's very sweet. It's beautiful, Denise. Good Job! Wow, Denise! It's truly a work of art! I love it! I love it! Don't you love happy accidents? I saw the dresser at the "Soiree" tonight, Denise! It looked great and so did your booth...in fact I so enjoyed the entire Faire! The food was fabulous...the wine divine...and the beautiful creations and vintage treasures so fun! Denise, It's perfect! Great job! So cute! Love the extra touches. 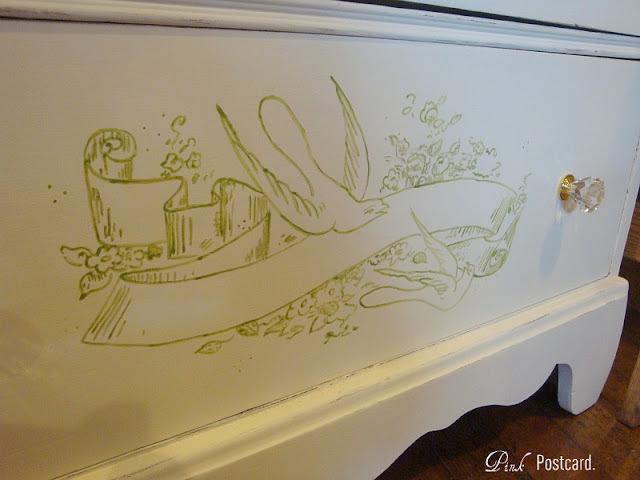 They make this dresser special! Love it, I have had many a success with mistakes!!! 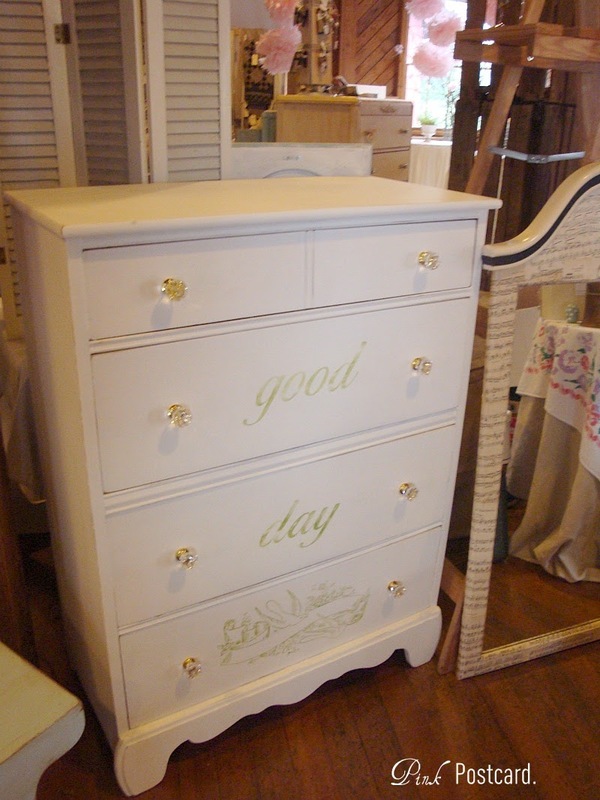 Your dresser turned out wonderfully! I love the stencils you added and think the "good day" would be a lovely thing to wake up to every morning, it's bound to put a smile on anyone's face! Denise that is beautiful!!! I love the color and the design and words that you chose!! ok so this is making me want to go redo a very brown dresser i own...like right now!! :) SO cute!! Your dressed is so sweet. I love the good day and was gling to ask you how you distressed it. Brilliant. Did you trace the bird banner on by hand or is there a magic thingy I need to know about? Thanks for sharing. I'm so excited to have found your blog from Metamorphosis Monday ~ this project turned out superbly. That is a huge improvement! Love the extra details you added. The knobs really make it sparkle. So pretty! denise, that looks beautiful! i love the graphic you chose for it, and the saying. that would be so sweet in a girl's room. Love this little guy! I may need to copy!!! Would you be flattered or sad ? Come see my little world of paint too! What a fantastic job you made of this - I'm in awe! So glad I found your blog through 'teh graphics fairy' and can't wait to back track and look through all of your older posts - so inspiring! This turned out beautifully! Just hopped over from Graphics Fairy, congrats on your feature! Love your Bella, too- I have two pugs myself! Looking forward to reading more...I am a new follower!